Update: This article is published a few years ago. 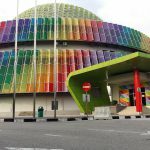 To get the most recent Padini store sales, please visit Padini Malaysia’s official Facebook page at https://www.facebook.com/padiniholdingsbhd/. 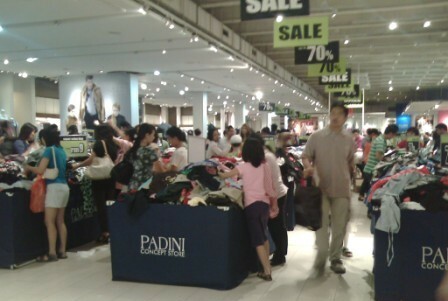 Padini stores nationwide is having storewide sales where heaps and heaps of clothes, bags and shoes (from Padini, Vinci, Seed and other brands) are being offered for about 50% to 70% discount. The sale is being held from 26 to 28 November 2011. 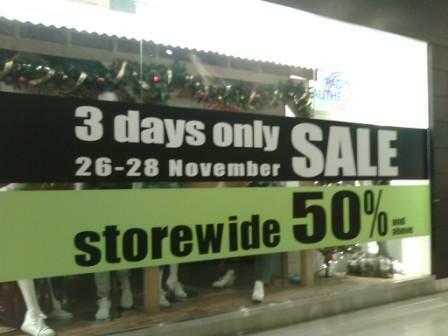 Without this, it is also having year end sale from 15 November 2011 to 2 Jan 2011. Not bad, some of the deals are quite good. 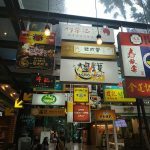 It is always good to make your clothes purchase during year end as it would be the time where most brands want to clear their stock. Example, the normal price for their shirts range from RM49.90 to RM59.90. A shirt that is RM49.90 would cost only RM14.70 in the sale. The range is more on casual wear and the Padini Concept store in Ikano has a lot to offer compared to the slightly smaller one in Curve.